"That's a bunch of insanity!" In the early 1980s one could mine some cheap laughs from the Vampira-esque form of the Mistress of the Dark Elvira (Cassandra Peterson) on the weekly Elvira's Movie Macabre. Peterson's big-wigged, big-boobed persona carved out something of career built mostly on cleavage, while lobbing lame jokes and puns in a soft-focus, candle-lit setting going in and out of commercial breaks. The reality is that her comedy isn't particularly funny, and my astute mind tells that if she didn't front the prominently on-display bosom that she does, her career would be a bust. Try the veal, I'm here all week. Shout Factory has begun issuing Elvira collections, essentially a full-version of the show with her minimal, mostly not-all-that-funny comedy, plus the unedited, standalone version of the particular horror film. 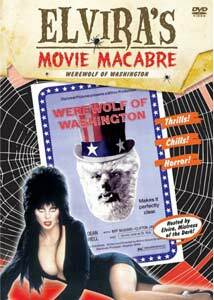 For this entry it's the very forgettable 1973 lyncanthropic yarn, Werewolf of Washington, starring Dean Stockwell as the titular doomed half-man/half-beast. Stockwell bears a disturbing resemblance to Sam Donaldson here, and oddly enough plays a shamed Washington reporter who runs afoul of a werewolf in Budapest, only to return to D.C. to land a gig as the press aide to the President (Biff McGuire). Havoc ensues, people are killed and by the time the credits are rolling there is a wacky "twist" voiceover ending that is embarrassingly bad. Directed with occasional glimmers of potential by Milton Moses Ginsberg—in particular an attack scene set in a toppled phone booth—the bulk of this one unfortunately tries to be too many different things all at the same time. The mixture of political satire (there's a shot of The Watergate Hotel, and characters confusing "pentagram" with "Pentagon"), comedy (witness Stockwell's Jack getting his fingers stuck in a bowling ball) and traditional horror (yes, there's an old-school time-elapsed transformation scene) seems too disjointed to be even slightly cohesive. The presence of the diminutive Michael Dunn (Dr. Loveless from TV's Wild, Wild West) as a scientist who gets his face literally licked by the affectionate werewolf, lurking about in the secret passageways behind those large public White House restrooms that exist in this movie, seems like he wanders in from some other picture entirely. Generally I'm a sucker for the werewolf genre, and I've seen more junk of the type than I can recall, but in terms of bottom-of-the-barrel scrapings, this one would have to probably be one of the worst. And while "bad" movies aren't necessarily always completely without merit, this one makes the mistake of not being just quirky, but instead lives and breathes as a "bad" horror/satire/comedy. And that makes it three times as painful. Image Transfer Review: As is the way for this series, the movie-only and the Elvira-induced versions are presented in 1.33:1. The print used here carries some muddy, murky, and then suddenly terribly faded colors, all amidst a wash of splices, nicks, scratches, and other ugly detritus. The somewhat hazy Elvira segments show their early 1980s age, and the level of detail being very soft, as if someone smeared a thin layer of vaseline on the lens. Audio Transfer Review: The mono audio track is a real piece of work. Bad work, that is. Sure, you get the typical hiss and crackle found on genre films of the period, but some of the dialogue is so mangled I sort of had to fill in the blanks on what was being said (not that I cared all the much, actually). Extras Review: There is a pleasing sameness to the design of Shout Factory's Elvira series, though there aren't any extras to speak of. The presentation keeps with the layout of the other entries, with a clear plastic case opening to show off the back of the front cover, which is adorned with a couple of Elvira images. An insert touts the other films in the series, and the flipside has another cleavage-heavy Elvira photo with an "autograph". The standalone film version runs 01h:26m:21s with 10 chapter stops, while the edited Elvira version clocks in at 01h:36m:12s with 20 breaks. The only extras are a pair of trailers, one for Good to See You Again, Alice Cooper and the other a commercial for the hip-sounding soundtrack to the Stubbs the Zombie videogame. Here's another entry in Shout Factory's well-meaning but ultimately dreadful Elvira series, a cheesy werewolf mixture of early 1970s horror and satire and attempted comedy that is so bad it's almost good. Almost.